Keeping blonde hair looking bright and vibrant can be difficult. Without the right products that are specifically designed for blonde hair, your colour can look dull and even dirty. Whether you have natural or coloured blonde hair there is an abundance of great hair products to help you keep your locks looking their best. 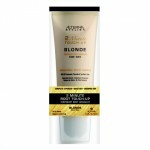 Alterna 2 Minute Root Touch-Up Blonde – Banish roots and grey hairs with Alterna 2 Minute Root Touch-Up Blonde. Convenient and easy to use, this temporary colour will wash out in just one shampoo, and is free from ammonia, peroxide and syntheic colour. 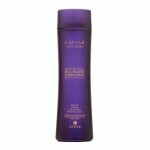 Alterna Caviar Brightening Blonde Shampoo – This Alterna Caviar Brightening Blonde Shampoo is designed to refresh and enhance the blonde tones in your hair, helping to eliminate brassiness and preserve your colour. Provides anti-ageing qualities for your hair, helping restore its youth and overall improve its appearance and tone, whether coloured or natural. Alterna Caviar Brightening Blonde Conditioner – Alterna Caviar Brightening Blonde Conditioner nourishes, enhances and perfects blonde tones, leaving hair with a highly reflective shine. Ideal for mature hair, this conditioner helps minimise the visible signs of ageing. 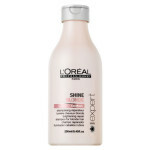 L’Oréal Expert Shine Blonde Shampoo – L’Oréal Expert Shine Blonde Shampoo is a specially formulated repair and protect shampoo for blonde hair. It brightens colour and leaves your hair looking and feeling hydrated and shiny. 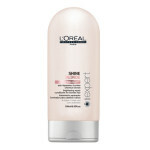 L’Oréal Expert Shine Blonde Conditioner – Triple action care for blonde hair. Used after Shine Blonde shampoo, the rinse-out brightening conditioner with Céraflash TM from Shine Blonde, repairs and protects all types of blonde hair from unwanted yellow tones. Given long-lasting colour protection, blonde hair recovers its natural shine. The Céraflash TM technology in Shine Blonde neutralises unwanted yellow tones, protects colour and adds brilliant shine to natural and coloured/highlighted hair. For more long lasting, bright blonde tones and soft, shiny hair. All products mentioned above are available to buy via our online shop. Filled with all the best hair care products and those we use in the salon, you could bag yourself a bargain, as many items are reduced. You can save 10% off your final bill until the end of October by using promo code ‘October10’ at the checkout. Opt for delievery or collect in the Taylor Hughes salon, it’s up to you.